William H. Harrison was the last president elected to office that was not a naturally born American citizen. He was born in 1773, in Berkeley, Virginia. His father signed the Declaration of Independence when William was just 3 years old. By all standards of the time, the Harrison's were wealthy and privileged and deeply patriotic. He studied classics and history at Hampden-Sydney College, then began studying medicine in Richmond. But at 18 he gave up those studies and took a commission as ensign in the First Infantry of the Regular Army. This led him to the northwestern frontier that would in time become Ohio. He was stationed at Fort Washington located in what would become Cincinnati. During his time in the Army, William learned he could lead men in difficult situations. In the campaign against the Indians, Harrison served as aide-de-camp to General "Mad Anthony" Wayne at the Battle of Fallen Timbers. Harrison saw battle again during the War of 1812. In the War of 1812 Harrison won more military laurels when he was given command of the Army in the Northwest with the rank of brigadier general. At the Battle of the Thames, north of Lake Erie, on October 5, 1813, he defeated the combined British and Indian forces, and killed Chief Tecumseh. The Indians scattered, never again to offer serious resistance in what was then called the Northwest. After the War of 1812, Harrison retired from the military as a Major General and returned to Ohio where he served as a congressman, state senator and a U.S. Senator. In 1836 he ran unsuccessfully for President. In 1839, the Whig party was looking for a candidate who could beat the incumbent President Van Buren. They held their convention in late 1839, months before the usual time for nomination proceedings. William Henry Harrison was nominated as the White party candidate. Harrison was a southern born war hero, seemed to make a perfect foil to use against the incumbent Democrat. Plus, Harrison's running mate, John Tyler, was from Virginia, the core state of Van Buren's Democrat Party. In the election, President Van Buren and his party made several serious errors in the conduct of their re-election campaign. First, Van Buren underestimated the Whig party, by assuming they were just a party of wildly diverse philosophies, incapable of agreeing on almost anything. Van Buren also assumed that the one thing that brought this diverse group of people together, was just their hatred of Andrew Jackson, who through a variety of acts during his presidency, so angered his opposition that all they could think about was how to remove him. Van Buren was Jackson's VP, and he then was elected President after Jackson decided not to run again. "Give him a barrel of hard (alcoholic) cider and settle a pension of two thousand a year on him, and take my word for it, he will sit the remainder of his days in his log cabin." This was all Harrison's campaign needed. Everything they could think of relating to "log cabins" and "whiskey" was rolled out. In fact, the term "booze" was coined during this election because of whiskey handed out at campaign stops, was distilled by E.C. Booz distillery. To further emphasize Harrison's rustic character, they decided to push this reference in hopes of connecting with the common man. One such association was the log cabin. Many log cabins in the Ohio territory were made from buckeye trees. The bottles of whiskey he handed out were in the shape of a log cabin, and today these original bottles are highly prized as collector's items (many glass manufacturers later copied the design). Harrison also incorporated the buckeye into his campaign and as a result of this marketing tactic, Ohio became widely known as the Buckeye State. One other common term that we still use today resulting from this massive marketing campaign involved a group of campaigners pushing a large 10' ball, decorated with pro-Harrison slogans, across the country and handing out the whiskey filled log cabin bottles. By the end of the campaign, there were parades 3 miles long of voters singing, chanting and drinking. The phrase they used: "Keep the ball rolling!" And that's what they did. The "real man of the people" was swept into the Presidency. 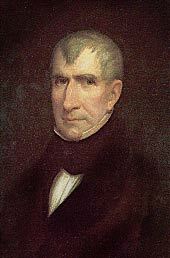 William Henry Harrison became the 9th President and took office on March 4, 1841 at the age of 68. He died one month later on April 4, 1841 having the shortest term in office of any chief executive. He was also the first President to die in office. It is commonly believed that Harrison caught a cold that developed into pneumonia after delivering a nearly 2 hour inauguration address in bad weather. 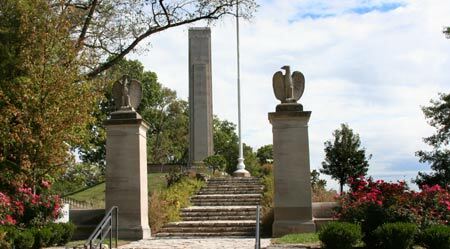 William Henry Harrison is buried in southwest Ohio about 15 miles west of Cincinnati off US50 on Cliff Road. When the 21 year old William Henry Harrison met her his soon to be bride in 1794, he was a lieutenant in the army. Anna Symmes was a wealthy and educated daughter of John Cleves Symmes. Within 2 months after first meeting Anna, William proposed marriage and asked Anna's father, John Symmes, for his daughter's hand. John Cleves Symmes was not too impressed with the young Harrison and believed he had little to offer his daughter and he forbade them from marrying. Symmes noted that Harrison, "can neither, bleed, plead, nor preach and if he could plow I should be satisfied." Not to be deterred, one day when the elder Symmes was out of state on business, Harrison and young Anna, were secretly married on November 25, 1795. 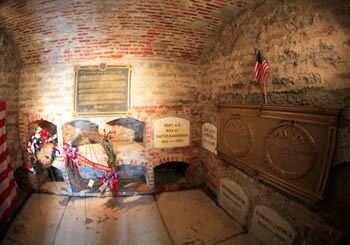 Anna died in 1864 and is buried with William in the Harrison crypt in North Bend Ohio.